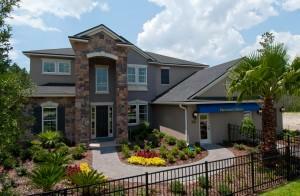 Providence Homes entered three model homes in the 2013 St Johns County Builders Council Parade of Homes. The Parade of Homes runs from 31 August -15 September featuring the finest builders throughout St Johns County. The Providence Normandy Model Home located at 1801 Duthie Park Court in Crestwood at Durbin Crossing is the 2013 Showcase Model Home. This 100% ENERGY STAR Certified model home features 4308 sqft living space with 5bdrms 3.5baths that offers a flexibility for a variety of families. There is also a virtual tour of the model home available on the St Johns County Builder Council website, “Providence Homes is thrilled to be part of the St Johns County Builders Council Parade of Homes,” said Director of Sales, Robert Goettlicher. “We welcome the chance to support the St Johns County Builders Council and this special event every year.” The other Providence Model homes entered this year are “The 2527” model located at 91 Willow Winds Parkway in Durbin Crossing South and “The 2287” model located 156 Cross Ridge Drive in Greenleaf Village at Nocatee. For more information, check out the St Johns County Builder Council website here.